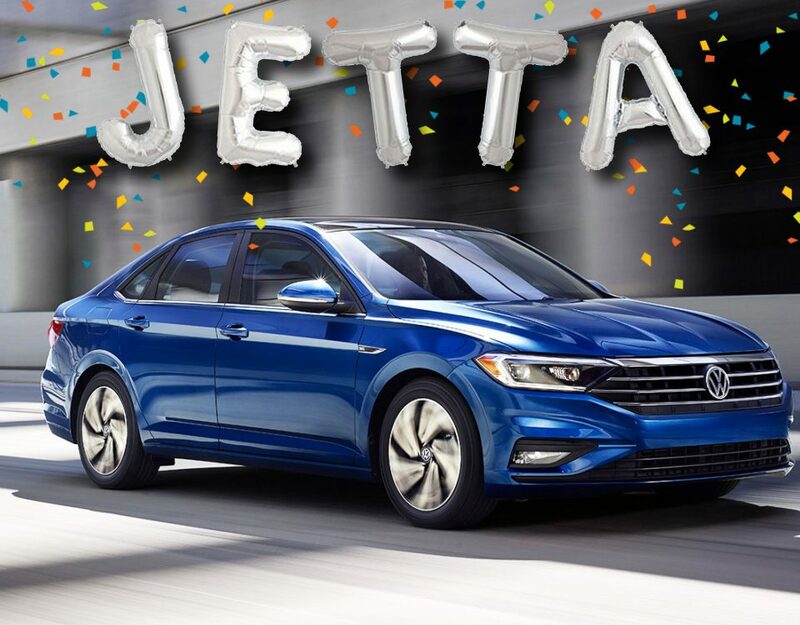 With the launch of the latest Beetle, VW created an edgier design, less cuddly than before and one that’s been attracting more aftermarket interest. 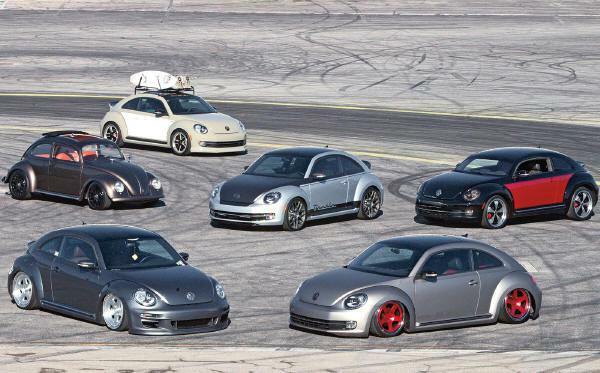 So VW of America planned to unleash some modified Bugs at the annual SEMA show in Las Vegas last November, encouraging a number of tuners to have a go. 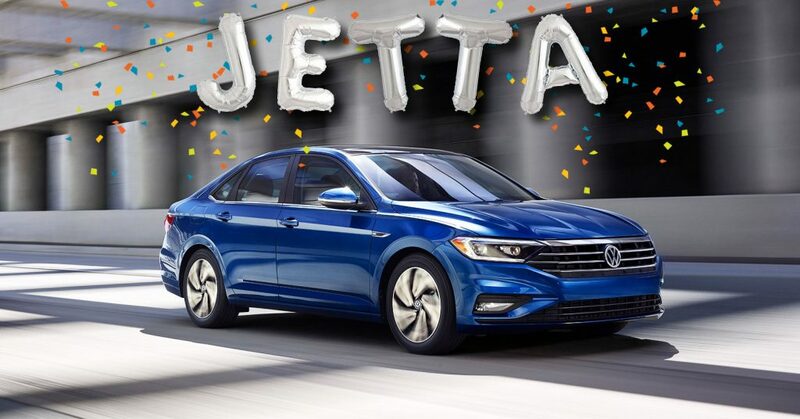 Without hesitation, VW tuning shops across the nation accepted the challenge to work on the iconic vehicle. These included fifteen52, FMS Automotive, Galpin Auto Sports, Rotiform, VW Vortex and even european car Magazine. 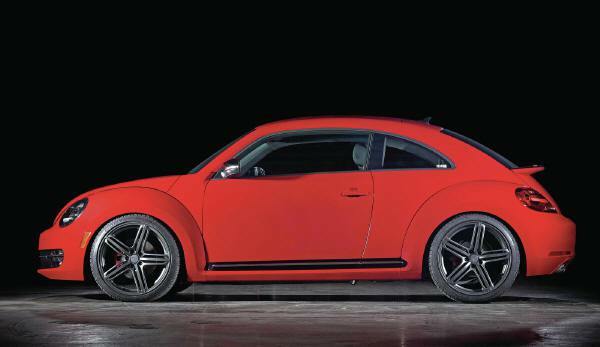 We all put the Beetle under the knife in the hope of changing people’s perception about the formerly “cute” car. Once the projects were completed we all headed to the 2012 SEMA Show to distribute the cars among the two million square-foot of trade show space. The desired effect was achieved; the cars winning the respect and admiration of visitors, with VWVortex taking home one of the show’s top honors: the PlayStation Gran Turismo – Best European award. Yet with the cars widely dispersed, we thought it would be fun to gather them into one space and review everybody’s hard work. Our own Surf Bug was featured last month (EC 4/13), so we’ll brush over it here somewhat, and sadly the Vortex car was receiving work on the East Coast and unavailable for the shoot. That said, if you’re looking for inspiration for a Beetle project car, we’ve got a pretty diverse bunch for you to enjoy, whether you’re looking for show, go or both. For Jay Johnston, his girlfriend’s Beetle was meant to be hers – after all, she picked it out at the dealership. But after a few months behind the wheel, Jay had a conversation with Matt Crooke at fifteen52 – specialists in wheel design and custom vehicle builds – and couldn’t help himself. He gave his girlfriend a few months with the car and then began the build process for its debut at SEMA. First up was the baseball-glove interior. Operating from a home workshop, a local interior guru (simply known as Adrian) helped Jay realize his vision for a stunning interior inspired by the original Audi TT. The final component was the Alpil aero kit imported form Japan. Its inspiration was apparently derived from the Porsche GT3, providing a motorsport undertone to the car. The stance movement has taken the world by storm, taking the importance of the right wheels and suspension from the European scene to the import and domestic arenas. And Rotiform has been riding the top of this wave with its extensive range of cutting-edge wheels that find themselves on project cars across the nation. When the company took ownership of its Beetle project it had to meet three prime objectives. 1, get it as low as possible. 2, clean up the engine bay. 3, look as mean as hell. Lowering would require some finesse, so they used the Air Lift kit with Accuair management, also fitting the independent rear suspension and subframe from an Audi A3, as well as Dorbritz Designs rear control arms. They did this to tuck prototype 19″ Rotiform superconcave NUE three-piece wheels. These would feature matte anodized red centers with polished lips. Under the hood, Rotiform went for an East Coast VW trend, shaving and smoothing the engine bay and rain tray, even relocating an Odyssey battery into the fenderwell. The bay was then painted gloss black to highlight all the fabrication. The job took two weeks and showcased the 2.5L five-cylinder under the hood with its GIAC software and Duarte exhaust. Rather than an exterior respray the body was treated to a vinyl wrap in 3M matte Metallic Silver, once the side markers and exhaust cut-out had been shaved. Of course, no Rotiform project would be complete without its famous French Bulldog, Orbit, a star of instagram (@rotiform_brian). Chopping the roof on a car takes balls. Many people think it’s simply a matter of removing a section from the pillars and welding it back together, but it’s far more complicated than that. Since the top is usually narrower than the bottom, you have to allow for the different angles, spending hours aligning everything. You also need new glass all around. A roof chop is generally tackled only by experienced bodyshops with expert craftsmen, and very rarely on a shape as curved as the VW Beetle. 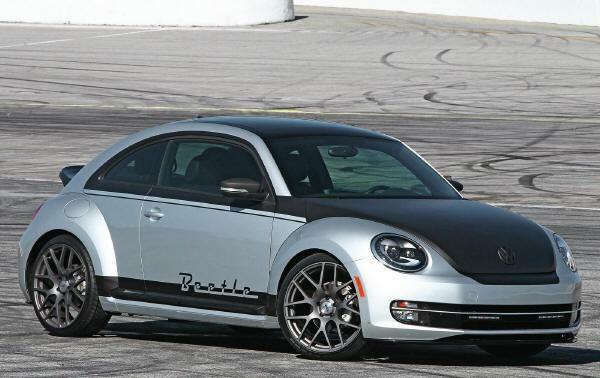 However, the team at Galpin Auto Sports decided to step away from its usual musclecar and domestic projects to give the new Beetle a go. Once the cuts had been made, 5.5″ were removed from the A-pillars and 2.5″ from the B-Pillars. A pair of custom scoops were fitted in place of the rear windows to creat a more dramatic outline and reduce the amount of custom glass needed. Having done all this work, the GAS team was confident enough to paint it Onyx Black with a Cal-Look treatment on the doors in Candy Apple Red metalflake. Helping to accentuate the custom treatment was a set of 20″ wheels that were custom-made by Forgiato and inspired by classic Fuchs-style Porsche wheels. Since the stance of air-cooled Bugs was always raked, thanks to the front torsion bars, Galpin decided to recreate the same appearance with a pair of Neuspeed lowering spring up front, while the rear remains stock. Inside, the factory seats were stitched in a 1950s design, while the dash was painted the same Candy Apple Red as the exterior. Taking home one of the biggest honors at SEMA, the Super Beetle was crowned Best European in the 2012 PlayStation Gran Turismo awards. And since it was us who chose the winner in that category, we wish the car could have been included in our gathering. Sadly, it was shipped back to APR in Alabama after the SEMA show for some final tweaks. Situated in the H&R suspension booth, the car won the hearts of practically everybody in attendance. You could follow the build thread on vwvortex and know this Beetle had been through extensive fabrication work to reach its final phase. 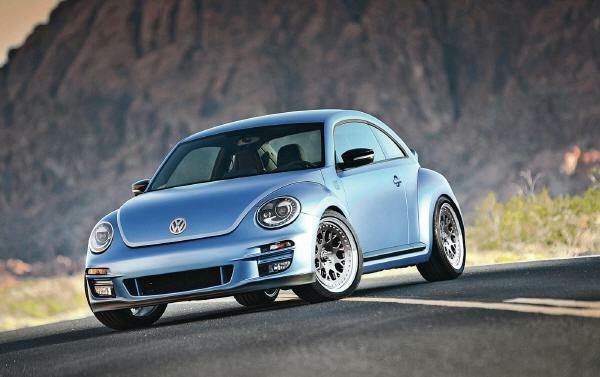 Squeezing a Golf R 4Motion drivetrain into the Super Beetle was no small task. After weeks of cutting and welding, it was ready for the same Alpil body kit as the fifteen52 Bug. In fact, the same guys also provided 19″ Formula TR three-piece wheels to further set it apart in its matte blue metallic finish. The huge task of installing the AWD conversion was in order to cope with the 500hp motor built by APR for the occasion (goapr.com). You’d be forgiven for thinking FMS Automotive is a relatively new name to the scene but has actually been providing quality accessories for more than 40 years. However, it does so behind the scenes, supplying body kit pieces to manufacturers such as VW for its genuine accessory range. Having lived in the shadows for years, the company has been coming to the forefront more recently, helping us build several VW and Audi project cars in the past, including our current Audi TT. 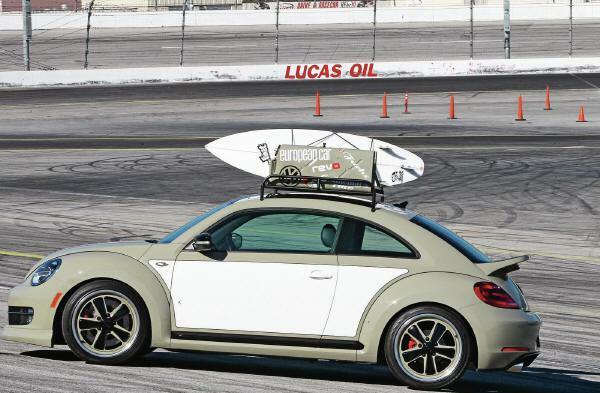 It also built a trio of Beetles for SEMA 2012, including our own Surf Beetle. The most ambitious project was the complete restoration of a ’56 Oval Window air-cooled Beetle that saw a bare chassis build-up. They also took the opportunity to bring the classic platform into the modern era with new performance parts such as a Wilwood big brake kit, H&R suspension and 17″ TSW Donington wheels. These would ensure the 2.1L engine could be fully exploited. In addition to a new leather interior, the car was painted in a toffee brown metallic, with matte black used on the hood and roof to call attention to the natural lines of the car. FMS also built a 2012 Beetle to show off its custom design and prototyping services. As such, FMS developed a new front lip that’s understated but enhances the new front spoiler. They also created a rear wing that definitely hinted at a Porsche ducktail. Furthermore, the rear bumper was modified to house an integrated diffuser. Although the car wasn’t lowered, FMS Automotive fitted a set of 20″ TSW Nurburgring wheels. The body received some vintage-style matte black graphics plus a painted hood, roof and trunk to emphasize its curves. You no doubt read about our Surf Beetle in the previous issue (EC 4/13). What some may not know was how the project came together in the final hours. Having only been on the job three months, our fearless leader decided I should oversee the final, stressful hours of the build before it was wheeled onto the transporter to leave for Vegas. With FMS having completed its work on the custom front lip, side moldings, rear diffuser, tailgate spoiler and roof rack, I was with the team into the wee hours of the morning to ensure the suspension was set, wheels mounted, spacers fitted and our big brake kit installed before the truck arrived. Needless to say, it was all hands on deck, calling in favors from Supreme Power Parts and Eurocode Tuning to get the tasks completed. As dawn broke, the car was finished and the next time we’d see it would be in Vegas. We did have a bit of a problem with the paint color being wrong, but it seemed to be a hit nonetheless. By the end of the show, our Beetle had gained favor with attendees, and show girls were posing in our mobile shower system. After the event we finally got to drive the car and the Revo Technik K04 turbo upgrade gives a kick in the pants. The engine conversion includes the Revo K04 turbo, software, intercooler, exhaust and intake. And while the production version will develop around 370hp, our car is said to be closer to 400hp thanks to a bit more boost. However, we’re going to put it back to Revo’s “stock” settings for the sake of longevity. Acceleration gets the Continental tires spinning on the 19″ Fuchs Performance Porsche wheels, but the Revo big brakes conversion quickly gets it all under control. And the high-tech Revo suspension with remote reservoirs means it handles supremely well once the surfboard has been removed. Cruising with water cans and a surfboard means the car looks like fair game, but little do they know the performance our Surf Bug packs! For comfort, the cabin has a Katzkin interior, bringing black leather outers and green alcantara inserts to the factory seats and door cards. 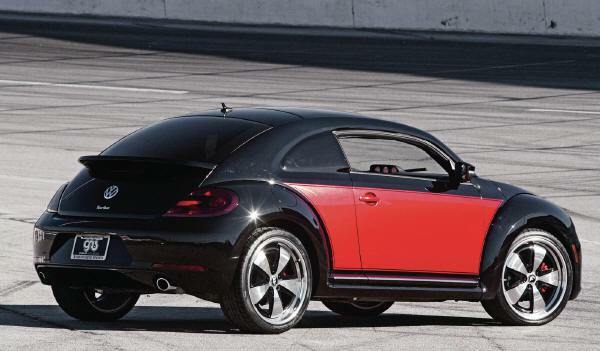 lthough not at SEMA this year, another Beetle was built during 2012 by H&R, reinforcing its long relationship with VW. 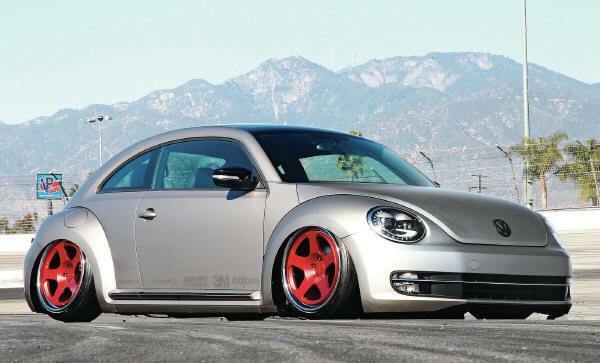 The H&R Beetle Turbo project used the company’s Super Sport Springs to lower it 1.7″ front and 1.5″ rear, with 5mm H&R Trak+ Wheel Spacers all round to kick out the 20″ Hartmann HRS6-204MA wheels into the generously-sized fenders. It was a pretty simple overhaul but shows what’s possible with the Beetle and the right performance parts (hrsprings.com).